GramercyOne is a leading provider of cloud-based business management and marketing solutions to service businesses around the world. GramercyOne�s platform provides the technical functionality businesses need to compete in today�s marketplace, including real-time mobile and online booking, digital marketing and integrated social media, CRM, hosted point-of-sale, mobile payment processing, and robust inventory management. The system is translated in to eight languages, operates in 56 countries and is processing more than 700,000 transactions per month, averaging in excess of $1mm per day in transaction volume. 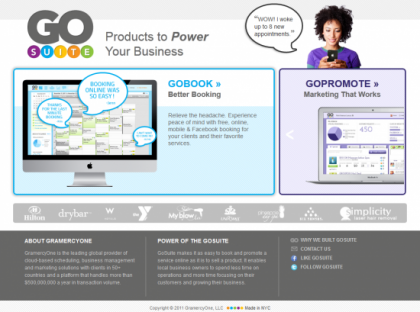 GramercyOne’s new GoBook is named App of the Week by Business Insider. 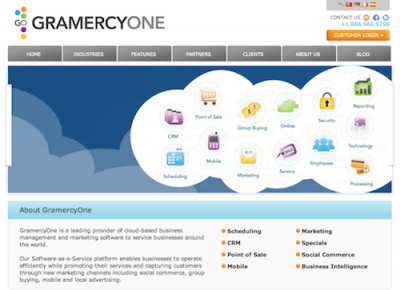 Affirming its position as the market leader in cloud-based business and marketing solutions for companies of all sizes, GramercyOne this week closed $14.5 million in Series A funding. Steve Case’s Revolution Ventures led the investment round, with Grotech Ventures, TDF, and Jubilee Investments. PKPR placed an exclusive story with TechCrunch. Other coverage of the announcement included Dow Jones VentureWire, TheStreet, Xconomy, Fortune.com Term Sheet, Tnooz.com, NYConvergence, and Spa Opportunities.